A graduate school Ph.D. candidate is helped into his white lab coat by his doctoral dissertation adviser and graduate program director. The ritual is part of the Graduate School’s Research Induction Ceremony, which celebrates the students for passing their qualifying exams and marks the formal beginning of their research. Oct. 1, 2018 | One minute they were all students — the next, they were scientists. It’s a little bit of magic that happens annually at the UAMS Graduate School’s Research Induction Ceremony, when Ph.D. candidates from a variety of disciplines put on the white lab coats that symbolize their dedication to science. 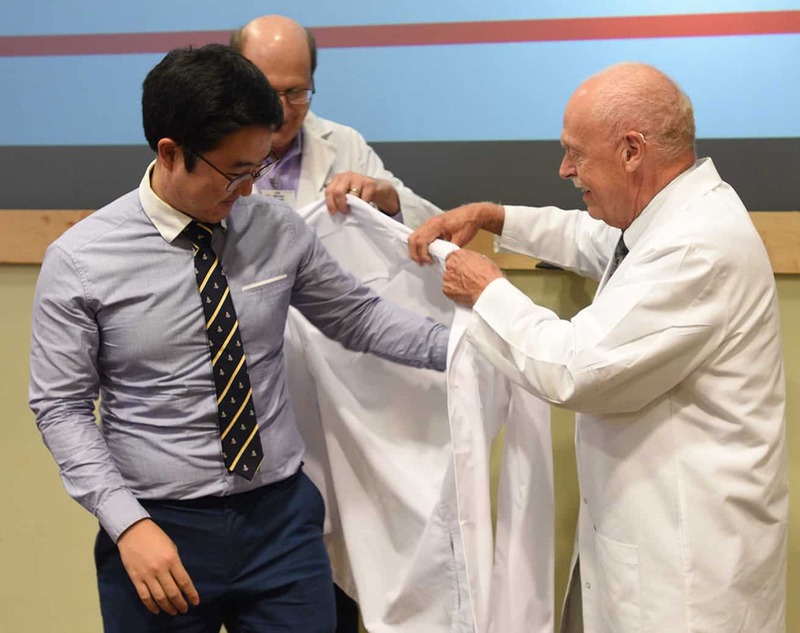 Each student is assisted in putting on their white coat by their doctoral dissertation advisers and their graduate program director. Together, they recite the affirmation of scientists before family, friends and peers. 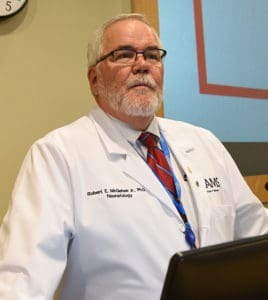 Magical, perhaps, but not simple or easy, Graduate School Dean Robert McGehee Jr., Ph.D., reminded the crowd — and by no means a sure thing. 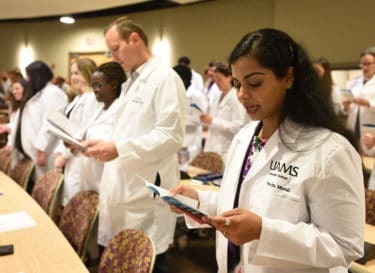 The students who put on their white coats have passed the rigorous pass/fail qualifying exams required by their fields. 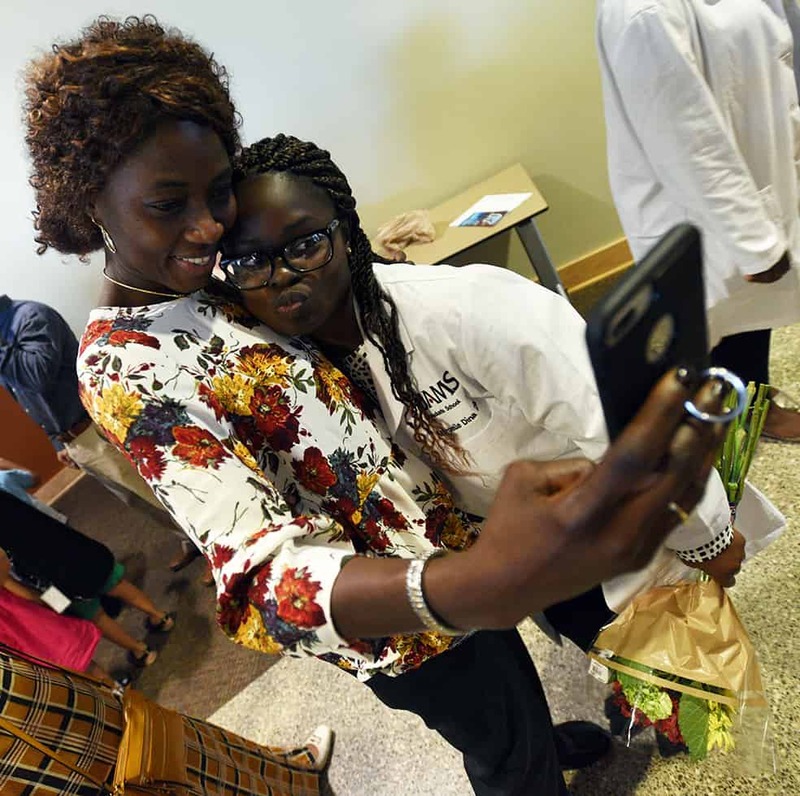 The ceremony marks their transition from students to researchers who are solidly on their way to earning a Ph.D.
Students and faculty read aloud the Affirmation of Scientists as part of the ceremony. Thirty-one students from seven programs participated in this year’s ceremony, which was one of the larger groups in the Graduate School’s history. McGehee said each individual student represents a unique set of circumstances and cast of characters who have helped them along their way. Support is key, and hard work and dedication are a part of each successful story. “None of them could do this without you, their families, backing them up,” McGehee said. Graduate School Dean Robert McGehee Jr., Ph.D., welcomes family, friends, peers and mentors to the ceremony. McGehee said that science moves slowly and is time-intensive. At times, family and friends may feel like they don’t see their loved one very much as they are hard at work on their Ph.D.
McGehee encouraged the students to value their relationship with their mentor, which, he said, “if it’s done right, it’s a bond that lasts for a very long time.” He also told the students to lean on each other for support. And ultimately, he told them to trust in the scientific process, which often includes dead ends and setbacks. Supporters celebrate the students’ successes during a reception after the ceremony. The Research Induction Ceremony was the ninth of its kind at UAMS. It was held in the I. Dodd Wilson Education Building first floor auditorium and was followed by a reception.